Contents to be added if publicised. Publisher solicitation: Optimus Prime and Megatron have opposed each other since the Transformers began, and their fight continues even into this year's big-screen movie. And now, this collection looks back at many of the most awe-inspiring match-ups of these two polar opposites, spanning decades of Transformers comics. See below for list of contents. 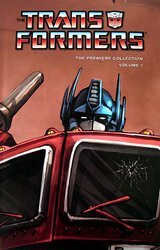 Publisher solicitation: This career-spanning hardcover looks at legendary Transformers writer Simon Furman's amazing output throughout the two decades he's worked on the Robots in Disguise, from his earliest beginnings through his current work. This collection compiles his U.K. work from 1985 through his G2 and War Within comics to his present IDW comics work and beyond! The premiere presentation of Simon's immense body of work. Reprints "Target: 2006, part 3" (Marvel UK #81), "Target: 2006, part 8" (Marvel UK #86), "Wrecking Havoc" (Marvel UK #172-173), "Bird of Prey" (Marvel US #62), "The Price of Life" (Marvel US #70), "Surrender" (Marvel US #71) "On the Edge of Extinction" (Marvel US #75), "Tales of Earth, part 4" (Marvel US G2 #7), "Tales of Earth, part 5" (Marvel US G2 #8), "War Within Preview" (Dreamwave, full), "Worlds Collide, part 3" (DW Armada #16), "Infiltration, part 6" (IDW), "Spotlight: Shockwave" (IDW), "Beast Wars: The Gathering, part 1" (IDW). Publisher solicitation: Artist Don Figueroa has been blowing away fans' conception of what Transformers comic book art is capable of being, and now his spectacular work gets the Premiere treatment. This special hardcover-with-dustjacket offers the ultimate presentation of Don's work, spanning his earliest work through his current work on the IDW movie prequel, including sketches, concept art and much more. Reprints Infiltration 0-6, Stormbringer 1-4, Spotlights 1-5, Escalation 1-6. Publisher solicitation: For strengthening forearm muscles, or getting the full story of the Transformers' "IDW-verse," look no further than the "Transformers: Premiere Edition". 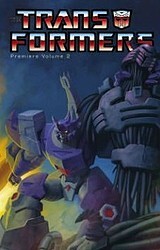 At just over 500 pages of non-stop 'bot action, if you only buy one "Transformers" book, ever, this is the one you need! Journey from Cybertron to Earth and back as the Transformers' legendary war spans the galaxy in a quest to return peace to their home planet, and restore harmony between all mechanoids. But while the noble Autobots seek their freedom, the Decepticons await with treacherous plans of their own. Collects issues #1-16 of Marvel US. Issues #3 and #9 are presented as illustrated summaries as Marvel refused permission to use the likenesses of Spider-Man and Circuit Breaker. 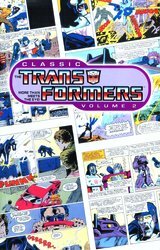 Publisher solicitation: Continuing IDW�s re-presentation of the beginnings of the TRANSFORMERS� comics lore. 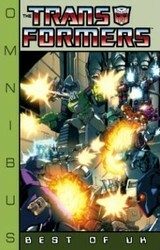 Join the original G1 characters as the ongoing war continues between the AUTOBOTS and DECEPTICONS. 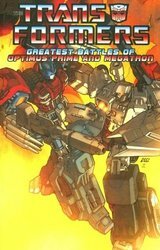 In this second collection, including issues #17-30, the AUTOBOTS create OMEGA SUPREME, SHOCKWAVE cedes command to MEGATRON, and the cast of mechanoids on Earth grows. Includes classic stories such as �Plight of the Bumblebee,� �Command Performances,� �Showdown,� �Funeral for a Friend,� and more. Collects issues #17-32 of Marvel US. Issues #22 and #23 are presented as illustrated summaries as Marvel refused permission to use the likeness of Circuit Breaker. Publisher solicitation: Starting out with the four-part "Man of Iron" story originally released for the U.K., then "Child's Play" blasts off with the ARK's first departure from Earth since crashing here in Issue #1, then Fortress Maximus' AUTOBOTS head to Earth, Buster gets captured by RATBAT, enter the PRETENDERS, and finally we visit with THE QUINTESSONS! 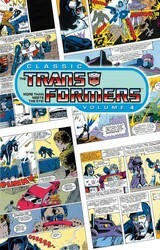 This collection of 14 classic TRANSFORMERS comics relives all the vintage glory of this pop culture powerhouse. Collects issues #33-46 of Marvel US, with issue #45 being presented as illustrated summaries since Marvel refused permission to use the likeness of Circuit Breaker. Publisher solicitation: Get a firm grasp on the entire Transformers: Beast Wars universe with this collection of The Gathering, The Ascending, and The Beast Wars Sourcebook! 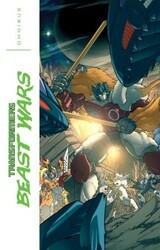 In The Gathering, Razorbeast and his fellow Maximals prevent rogue Predacon leader Magmatron from raising an army on Earth to wage war against Cybertron. But in The Ascending, Magmatron, now a disembodied entity, existing out of time and space, is witness to Cybertron's unchecked descent into chaos and madness, all of which is a prelude to its complete and utter destruction! Powerless to directly affect this terrifying apocalypse, Magmatron's last, desperate recourse is to try and bring his greatest enemy, Razorbeast, together with fellow Maximals Lio Convoy and The Pack. 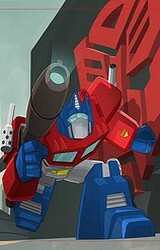 Whatever happens will determine the fate of both Cybertron and the Earth! Also included in this special collection is the entire Beast Wars Sourcebook, an in-depth look at the characters that inhabit the Beast Wars universe - bios, weaknesses, abilities, and more are presented alongside vibrant renditions by some of Transformers most revered artistic talents! Publisher solicitation: Worthwhile Book. Learn what makes Optimus Prime, the famous leader of the valiant Autobots, who he is in this hardcover picture book aimed at young readers! Specially written and illustrated for developing readers, I Am Optimus Prime will delight and captivate a whole new generation of Transformers fans through this colorful hybrid picture book/comic book. Publisher solicitation: This massive volume is the second in IDW's muscle-making series of Transformers Premiere hardcovers. 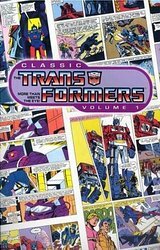 Collects the stories Devastation, two volumes of Spotlights featuring characters ranging from Soundwave to Wheelie, and the concluding Revelations stories. 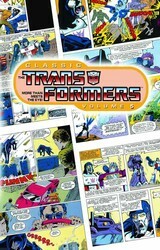 Publisher solicitation: Presenting IDW's fourth volume of vintage Transformers lore. This collection includes issues #47-61 of the original Marvel series. 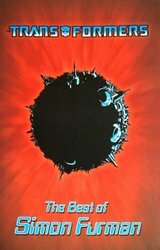 Enjoy the four-part "The Underbase Saga," as well as stories like "The Man Machine," "King Con" and "Primal Scream!" 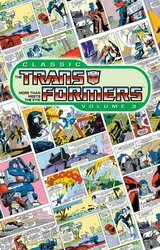 Publisher solicitation: This collection of classic Transformers stories from the UK market delivers massive thrills stretching across both time and space as the heroic Autobots work to stop the machinations of Megatron, Galvatron, and a heap of other Decepticons that put the futures of Earth, Cybertron, and the entire Transformers universe in jeopardy! 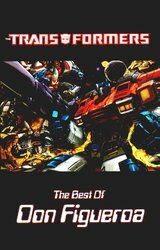 Includes Best of UK: Dinobots, Best of UK: Space Pirates, and Best of UK: Time Wars. Publisher solicitation: The war between the Autobots and Decepticons rages on. This fifth collection of vintage Transformers lore spans issues #62-74, and draws closer to the conclusion of the original series! Enjoy the five-part "Matrix Quest," as well as stories like "Deadly Obsession," "The Human Factor," "...All This and Civil War 2," "Out of Time," and "The Void!"